1981 Salvadoran Humanitarian Aid, Research and Education Foundation (SHARE) founded in Washington, DC. New El Salvador Today (NEST) founded in the San Francisco Bay Area. 1982 SHARE works with Salvadoran refugees in the UN-sponsored refugee camp at Mesa Grande, Honduras working closely with Catholic Relief Services (CRS) and with Mexican Bishop Sergio Mendez Arceo; launches strategic relationship with the Archdiocese of San Salvador to support internally displaced refugees in El Salvador. NEST continues supporting economic development projects. 1983 As they battle concerted efforts by the Honduran, Salvadoran, and U.S. government efforts to relocate them further into the country, SHARE begins accompanying refugee communities in UN-sponsored refugee camps in Honduras back to El Salvador; SHARE’s Board of Directors conducts fact finding visits to El Salvador as guests of the Archdiocese of San Salvador, visiting displaced communities taking refuge in local parishes and opens dialogue with the Lutheran Church in El Salvador and the broader ecumenical community. The delegation becomes the first of numerous annual delegations SHARE sponsors in succeeding years. NEST facilitates the first Sister Community relationship between the city of Berkeley and San Antonio Los Ranchos in Chalatenango. 1984 SHARE publicizes refugees’ treatment by the Honduran Armed forces and the militarization of the camps. 1986 SHARE testifies before the U.S. House of Representatives Western Hemispheric Affairs Sub Committee on behalf of Archbishop John R. Quinn about the situation of human rights violations in El Salvador. SHARE and NEST mobilize political support and $100,000 in financial support for the victims of the October earthquake. SHARE launches the Sister Parish Program to create sistering relationships between U.S. parishes and parishes in San Salvador with a high internal refugee population. SHARE awards its first annual Human Rights award to Jesuits Jon Sobrino and Jon Cortina in recognition of their dedication to social justice and human rights. SHARE expands its humanitarian aid partners to include the Lutheran and Baptist communities in El Salvador. Launches the SHARE Advisory Board of national religious leaders and opens its El Salvador office. The Interfaith Office on Accompaniment (which worked with both SHARE and NEST) sends delegations to accompany the first repopulations from refugee camps to the communities of El Barillo and San Jose las Flores. 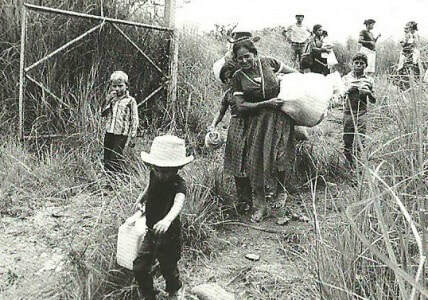 1987 SHARE launches the Going Home Campaign, a national campaign that generates political, moral and financial support for 4,000 refugees who seek to repatriate their homeland from Mesa Grande to their home communities in Chalatenango and Cabañas, El Salvador. 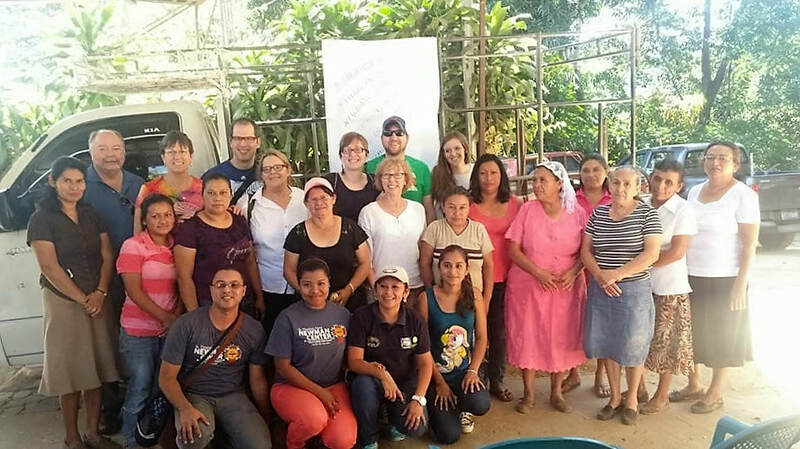 In addition to working closely with the Archdiocese of San Salvador, the Lutheran Church in El Salvador, and the Baptist Church, SHARE expands its key partners to include DIACONIA, The Episcopal Church of El Salvador, CRIPDES and CORDES. The Going Home Campaign initiates the One Million Seeds of Hope campaign to raise one million dollars to rebuild bombed out villages. SHARE opens its west coast office in Berkeley. 1988 SHARE continues providing moral, political, and financial support to refugees returning home from Mesa Grande, ongoing humanitarian support to displaced communities in El Salvador and continues to send delegations to repatriated communities and refugee camps in an act of physical accompaniment. SHARE and NEST continue congressional outreach. 1989 FMLN launches the Final Offensive and the fighting comes to San Salvador. Six Jesuits and two women are assassinated by the army at the University of Central America. SHARE and NEST intensify advocacy to stop US military aid and press for a negotiated resolution to the war. SHARE organizes a delegation of U.S. Lutheran and Episcopalian Bishops and prominent theologians to accompany exiled Lutheran Bishop Medardo Gomez as he returns to El Salvador to celebrate Epiphany and call for an end to the repression. SHARE intensifies its educational outreach in the US and in the US Congress, advocating for an end to military intervention and the promotion of a political solution. 1990 After a military attack on Corral de Piedra in Chalatenango, killing children, SHARE organizes an emergency delegation. SHARE’s Going Home Campaign reaches one million-dollar goal from their Seeds of Hope Campaign. SHARE sponsors a delegation of Catholic Bishops to mark the first year anniversary of the martyrdom of the Jesuits and deliver the annual SHARE Human Rights award to the University of Central America “José Simeon Cañas,” the Jesuit University. SHARE supports high level roundtable discussions between the military High Command and the FMLN and other major stakeholders in partnership with the Central America Resource Center, in pursuit of a negotiated settlement to the conflict. 1991 NEST supports the Association for Promotion of Community Development for Central America, which trained community members as dental care workers and operated community dental clinics in the shanty towns of San Salvador and in rural communities that had no previous access to oral care. In the first six months of 1991 the 200 dental care workers in El Salvador performed 18,000 fillings, 3,000 scalings, 6,000 extractions, made 500 prosthetic devices and provided dental health education to 90 communities.The Reebok Human Rights Award is given to Mirtala Lopez from CRIPDES. 1992 Historic signing of the Peace Accords in Chapultepec, Mexico on January 16th, SHARE and NEST are present. In October, SHARE and NEST merge and become SHARE Foundation: Building a New El Salvador Today. 1992-1994 Major advocacy focus is on the completion of the land transfer program outlined in the Peace Accords. Sister Parishes continue to accompany communities in El Salvador through delegations and by sponsoring tours of Salvadorans to visit the States. 1993 SHARE brings a delegation of Bishops to El Salvador on the one year anniversary of the Peace Accords. 1994 SHARE brings a delegation to El Salvador to observe the presidential elections; the first elections following the Civil War in which the FMLN participated as a political party. 1995-1997 Tecoluca becomes SHARE’s target area for rural development support. Debt forgiveness of the land transfer debt is acquired through internationally coordinated advocacy. SHARE works with the Foro Agro, CONFRAS and Funde in their work to craft alternative rural development proposals for El Salvador, challenging the maquila model of development. This includes bringing academics to El Salvador, funding coalitions of agricultural groups in El Salvador, and bringing them to the United States on tour. 1998-1999 When Hurricane Mitch devastates communities in the Lower Lempa region in 1998, SHARE rallies support in the United States for disaster relief. SHARE advocates for communities to have a voice in the reconstruction after the Hurricane. SHARE expands target area work further into Zacatecoluca, La Paz, and Lower Lempa Area of Usulután. 2000 Twentieth anniversary of Monsignor Oscar Romero’s death and memorial delegations from abroad unite people of all countries. Over 60 women religious attend a SHARE delegation in honor of the 20th anniversary of the martyrdom of the four US churchwomen. 2001 Earthquakes ravage El Salvador; SHARE mobilizes support and funds projects with long-term development vision. $44 million dike and drainage system in the Lower Lempa completed as a result of SHARE funding, advocacy, and accompaniment. 2002 SHARE hosts 20th Anniversary celebrations in El Salvador and the United States culminating with a 3-day celebration in DC, including a lobby day with Salvadorans and US grassroots visiting Congressional offices and the Inter-American Development Bank. 2003 SHARE continues its transition from the Lower Lempa to the new target area in Chalchuapa and Atiquizaya, in the western part of the country. 2004 SHARE brings 112 people on a delegation to observe the Presidential elections. 2005 Over 140 delegates come to El Salvador to celebrate the 25th Anniversary of the Martyrdom of Monsignor Oscar Romero. Nearly one-hundred delegates come for the 25th anniversary of the four US Churchwomen’s martyrdom. SHARE works at the forefront of the advocacy fight against the Central American Free Trade Agreement (CAFTA). Although CAFTA passed, it was the most contested trade debate ever. SHARE coordinates disaster relief and reconstruction after the eruption of the Ilamatepec Volcano and Hurricane Stan. 2006 SHARE celebrates its twenty-fifth anniversary. SHARE begins to work with 100 women as part of an adult women's literacy project in Jiquilisco, Chalchuapa and Atiquizaya. SHARE also begins its support of communities threatened by metallic mining. 2007 SHARE joins the National Working Group Against Metallic Mining in an effort to prevent mining in El Salvador. SHARE supports the movement to free the CRIPDES activists who were unjustly arrested in Suchitoto during a protest against water privatization and to demand water rights in their communities. 2008 SHARE launches the Seeds of Hope Campaign in an effort to provide food security for rural farming families affected by drought and flooding as a result of climate change. SHARE supports the second phase of construction of the Monument to Truth and Memory in Cuscatlan Park, etching an additional 3000 names and a list of over 200 massacres into this public monument. 2009 SHARE recruits and trains over 160 international election observers including lawyers, students, labor and religious leaders and other concerned citizens who travel to El Salvador to support free and fair Presidential Elections. For the first time in history, progressive forces in Salvador win the elections. Mauricio Funes, the FMLN candidate, is elected President of El Salvador and assumes the presidency in an historic peaceful transition of power. SHARE continues to support the anti-mining movement in El Salvador as mining activists are persecuted and killed, including Marcelo Rivera, disappeared, tortured and killed in June. 2010 SHARE brings a delegation of 45 people to commemorate the 30th anniversary of the martyrdom of Monsignor Oscar Romero in March, and in December brings a delegation of 50 people to commemorate the 30th anniversary of the martyrdom of the Four North American Churchwomen. SHARE participates in the Romero Coalition, a movement of human rights groups seeking justice in the murder case of Monseñor Romero. 2012 SHARE, in collaboration with IBEW 1245, launched a “Stand with Our Sisters” Campaign in support of over 57,000 women religious represented by the Leadership Conference of Women Religious (LCWR), the leading organization of Catholic sisters in the United States. The Campaign was in response to the Vatican’s crackdown on LCWR and was spearheaded by IBEW 1245 Catholic labor organizers. Eileen Purcell and Fred Ross. Purcell, former Executive Director of the SHARE Foundation during the war years, drafted the public manifesto, “Honor Conscience, Defend Religious Freedom, Stand with American Nuns,” in consultation with a small group of women and then circulated it on line to build support. More than 2,000 lay men and women signed the statement and made financial contributions to SHARE for its publication in the National Catholic Reporter (NCR) and the London-based Tablet. The following December, 60 women religious traveled to El Salvador as part of a Honoring Women Religious Delegation. 2013 Human rights office Tutela Legal that housed 80% of the records of human rights violations during the war was shut down. This closure remains somewhat of a controversial mystery. SHARE organized a tour to support the re-opening of a new Tutela Legal named after human rights champion and former SHARE board member, Maria Julia Hernandez. SHARE continued fighting for the adoption of Article 69 to establish food sovereignty and food safety measures. SHARE partnered with The Fruit Tree Planting Foundation and local cooperatives to launch the planting of 100,000 fruit trees over the following years. 2014 Over 100 delegates traveled with SHARE to observe the first and second rounds of the presidential elections as well as the inauguration of the new president Salvador Sánches Cerén. SHARE supported LGBTI organization to demand the right for trans folks to vote in the context that every citizen has the right to vote. Later in the year, forty women received diplomas for developing leadership skills that enabled them with higher levels of political participation. 2015 SHARE is awarded a Special Recognition by the Salvadoran Legislative Assembly for its 35 years of support for reconstruction of community infastructure, human development projects, organization and empowerment of rural women and youth, and support in building a new system of democracy. Over 100 delegates traveled with SHARE to commemorate the 35th anniversary of the martyrdom of the Four North American Churchwomen. 2016 SHARE celebrates its thirty-fifth anniversary, partnering with U.S. Sister Cities, SALVAIDE and CRIPDES to host an international sistering and solidarity gathering. The gathering looks back on over 30 years of solidarity and looks forward to the future of solidarity between the peoples of El Salvador and the U.S.